A client has asked me to teach her housekeeper to cook with her tagine. Now I am embarrassed to say that I have cooked many tagines, but not in an actual tagine. I also have a tagine standing very decoratively in my collection sadly gathering dust! So what a great excuse to dust it off and give it the love it has been lacking for so long while I make sure that I can teach this technique with confidence. 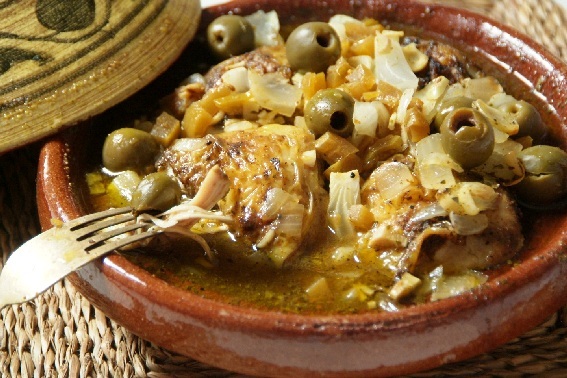 The one Morocco dish I fell in love with years ago was the chicken with preserved lemons and green olive. What a spectacularly unique (at least in our South African kitchens) set of flavours. So this is the dish I christened my tagine with today and the result were succulency moist chicken with a salty, lemony, olivey sauce that I can't wait to mop up later with loads of saffron and almond couscous! In Cape supermarkets, you readily find bottled lime pickle with the other Cape Malay condiments and even though it isn't strictly speaking the Moroccan preserved lemon, it is delicious and readily available. This dish is just as easily made in an appropriately sized casserole dish with a well fitting lid. Place the rack at the bottom of the oven, return the tagine to the oven and reduce the temperature to 160˚C on all round heat. Bake for 45 minutes. I must say this revised version of the recipe is a huge improvement on that one... wasn't bowled over with the result that night? This one however is spot on, I think!